The astonishing find in a Munich flat of 1,500 paintings missing since 1939 points to two art crimes. The first is Adolf Hitler's crusade to fill his Fuehrermuseum at Linz, Austria, with the supreme paintings of the world - looted, confiscated and purchased by the Nazis in the occupied countries of France, the Netherlands, Belgium, Austria, Czechoslovakia, Poland and Russia. The second is the crime of covering up the truth ever since. Cornelius Gurlitt, 80, whose hoard of paintings in Munich was allegedly hidden behind a wall of ancient cans of food, has kept his secrets for 68 years. What they tell us about Hitler is more important than what they reveal about Gurlitt. His pictures descend from his father, Hildebrand, one of four senior Modern Art dealers in Germany who were appointed in March 1938 to the Nazis' Confiscation Committee - with orders from Hitler and Herrmann Goering to sell "degenerate art" (entartete Kunst) for foreign currency. Hildebrand Gurlitt, Karl Buchholz, Ferdinand Moeller and Bernhard Boehmer set up shop in Schloss Niederschonhausen, just outside Berlin, to sell the near-16,000 cache of paintings and sculptures which Hitler and Goering removed from the walls of German museums in 1937-38. They were first put on display in the Haus der Kunst in Munich on 19 July 1937, with the Nazi leaders inviting public mockery by two million visitors. Propagandist Joseph Goebbels in a radio broadcast called Germany's degenerate artists "garbage". Hitler opened the Haus der Kunst exhibition with a speech, at the end of which saliva fell out of his mouth in rage. In it he described German art as suffering "a great and fatal illness". Hildebrand Gurlitt and his colleagues did not have much success with their sales, mainly because art labelled "rubbish" had small appeal. So on 20 March 1939 they set fire to 1,004 paintings and sculptures and 3,825 watercolours, drawings and prints in the courtyard of the Berlin Fire Department. The propaganda act raised the attention they hoped. The Basel Museum in Switzerland arrived with 50,000 Swiss francs to spend. Shocked art lovers came to buy. What is unknown after these sales is how many paintings were kept by Gurlitt, Buchholz, Moeller and Boehmer and sold by them to Switzerland and America - ships crossed the Atlantic from Lisbon - for personal gain. Gurlitt was arrested by the Allies near Bamberg in 1945, hiding in the castle of Baron von Pollnitz. He turned down an offer from the baron to hide his art collection in a new secret place. Or so he let a writer know. What we now know is that he did successfully hide more than 1,000 paintings - or his teenage son did. It is possible they were cached in France. Gurlitt's chief job on the Confiscation Committee was to work in Paris during the war, where he lived from 1941 to 1945 in the Hotel de Jersey. He had two ways of collecting for Hitler's Fuehrermuseum. One was to visit abandoned Jewish homes and remove their artworks; his licence was a Nazi law declaring that French nationals who had fled had lost French citizenship. The other was to spend Reichsmarks at the Drouot auction house in Paris, where distress sales were big business. Gurlitt was no small buyer. He paid more than one million French francs for the four most expensive paintings in the highest-value Paris sale of the war - the Georges Viau Impressionists auctioned by Etienne Ader between 11 and 14 December 1942, which fetched £922,000 in wartime values. The sale's top price of 5m francs was paid by Gurlitt for Cezanne's Vallee de l'Arc et Mont Sainte Victoire. It demonstrated Nazi purchasing power. Unfortunately the tiny painting, for which Gurlitt gave 94 times the then record for a Cezanne, proved to be a fake. So what was stored in his son's Munich flat? It is highly likely that pictures acquired in France are foremost and it is French families who will emerge to make claims for them. But there must also be German museum confiscations of Picasso and Matisse and paintings taken from Jewish owners in both Germany and Austria. Gurlitt would have intimately known their value. The top price for Matisse reached £2,600 at auction in 1941, that for Picasso was £880 (paid for a Blue Period Blind Man by the Toledo Museum in Ohio). Gurlitt did not set fire to these nor hand them over. He kept them for himself. Art is the last unfinished business of World War Two. 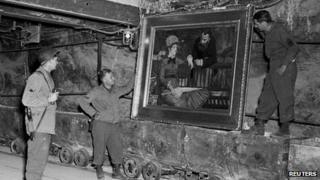 Though the Allies uncovered large numbers of stolen paintings in 1945 in the Alt Aussee salt mines near Salzburg, and in a castle south of Munich, an unknown number have been lost forever. Russia holds more than 120,000 wartime art objects in three museums round Moscow. In many cases, the quality of vanished art was the highest. An important Raphael - Portrait of A Young Man - taken from Catholic owners in Poland heads a list of missing art which amounts to a small National Gallery: paintings by Rubens, Van Dyck and Rembrandt to the fore. Five years ago Austria revealed the existence of more than 10,000 paintings and sculptures, hidden since 1945 in monasteries along the Danube and in state institutions. In 1937, the Nazis staged an exhibition to ridicule modern art - it went on to be one of the best attended modern art exhibitions of all time. Their Jewish owners had not been traced; how hard the Austrian government had tried to trace them was not made clear. An Austrian list exists on the internet for descendants of the original owners to come forward - if, that is, they can prove the ownership of Jews in concentration camps, or who fled in panic without documents or photographs as Nazi forces approached. London dealers close to the "restitution" business predict that 100 to 150 paintings will come off the walls of German museums in the next 25 years and be restored to the families of their original owners. As paintings washed around Europe in the 1950s without clear ownership, German museums whose collections of the 20th Century had been wiped out by Hitler bought what they could, at cheap prices, without asking too many questions. The past now catches up with the present. Lawyers in Vienna and Berlin now offer "no win no fee" deals to the descendants of concentration camp victims. The Nazis and their art collecting will continue to make headlines.